Satomi High's Football Club members are bunch of weirdos, there's a former yankee (delinquent), a former Hikikamori, one short-tempered guy and on top of that their captain is a 'chibi' (shorty), who looks more like primary schooler than a 2nd year high schooler, but don't be fooled - despite the fact of being all-freshman brand new team in a brand new high school, those guys made it to the best 4 of Chiba Prefecture last year! Their newest recruit is an almost 2m high guy, who is surprisingly bad at headings (despite having a height advantage). Fortunately the chibi-captain notices his potential as an attacking midfielder... How far can this team possibly go in this year's tournament? Welcome!!! This shouldn't be my first review, but my disappointment after knowing this manga was discontinued made me do this and kinda promote the manga awesomeness and point out some probable stuff that made Shueisha drop this series. 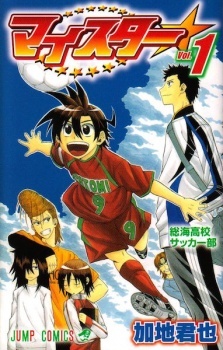 The manga has a classic High School, comedy, action, sports feel that any soccer manga has. A probable reason to its bad reception. A summary is unnecessary, so let say the story is filled with a total randomness of different characters and a High School Soccer team that broke the traditions of an entire Regional League... Some didn't believe in them, some others were happy with them... In the end the team did what they wanted and had one of the best performances a soccer team can have. The story killed the manga... I want to think that the manga was not well received due to the theme it used and not the unrealistic twist it took... Thou unrealistic, I liked the backstory it was refreshing and nice to get to know. Maybe chapters 3 to 6 killed the manga... thou the story introduced in those chapters was vital for a further development. Art: 87 out of 100% ==> 2D Action!!! Clean cut....Crispy and nice... quite a Jump's Classic art style... I loved the action of the manga... It was portrayed amazingly well... The characters were nicely done, and even the backgrounds are noticeable and clearly separated between the characters and themselves. Art definitely wasn't the reason the manga was discontinued. It's hard to understand how can a bunch of weirdos and sociopaths can play so well as a team and why they have such a great performance? Well they have one of the most optimistic and happy-go-round mentalities seen in a sports manga. Yankees, shorties, giants, hikikomoris, leaders and a bunch of other seemingly common people is a unpredictable mix to form a team... but well what's important they have it... At least they could have gone farer this time... but their dreams were shattered in the end. Everyone had an identity as a team and as individuals... that was nice. Enjoyment: 98 out of 100% ==> A proud Soccer fan! The most subjective rating ever created for a ranking... The soccer fan inside me enjoyed the short match between Kuromine and Satomi... The soccer facts were nice and a great setting for a promising future... Weird, but perky characters that made a story better... Tournaments and Happy and 'Have Fun' attitude filled the pages of this short lived manga... I can't say with words how much I enjoyed reading the manga while it lasted. Re-read Value? Very Low... One time is enough to get a hold of the whole setting, the story and the characters... The short life it had doesn't help its Re-read Value. Shrimpy, Wimpy, useless, apathetic? No problem you can do it here!!! Thanks for reading people!!! Feedback is greatly appreciated... Helpful Feedback: Thanks a lot!... Not Helpful? PM me and tell me why and how to make better reviews! Grammar or spelling corrections are also received and appreciated.